We drove four similarly priced diesel cars from Mumbai to Kolkata - the 2013 Ford Ecosport, Honda Amaze, Chevrolet Enjoy and Mahindra Verito Vibe. The long drive gave us ample time and opportunity to review and compare these cars, basically push them to the limit, throw them into corners and turn them upside down. 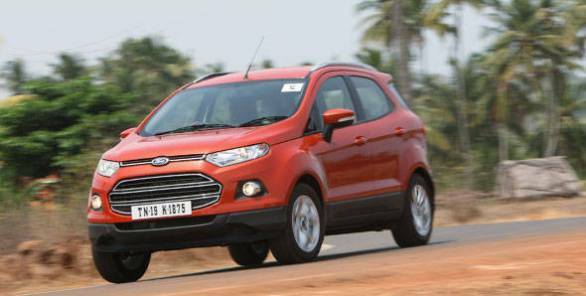 The idea was to compare the new Ford Ecosport with its market competitors. We present you the first of our four-part series, which includes the Ecosport going head-to-head with the three challengers and the magnum opus, a four-way showdown that concludes in Kolkata. The Amaze isn't a car that you will want for it's features. It simply cannot match the Ford EcoSport in this aspect. To make it worse fro the Honda, the Ford also happens to be the most feature-loaded car in the sub-Rs 10 lakh segment today. The little Honda then simply gets thrashed in the features game. The top variants get two front airbags but then the Ford gets six. There are no leather seats while the stereo only offers AUX and USB connectivity. 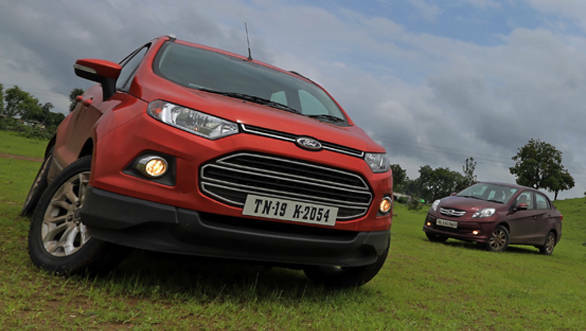 The Amaze after the EcoSport feels quite basic even though it isn't exactly short on comfort or safety features. The car, however, scores higher when it comes to space and packaging. It is under 4 metres in length like the Ford, but the difference in cabin space is easily noticeable, especially when it comes to rear knee room and shoulder room. The Amaze scores more on both counts. The boot, with 400 litres (54 more than the EcoSport), swallows in more luggage too. But when it comes to loading taller objects, there simply isn't a way to do it because it doesn't get foldable seats nor can it boast a bigger boot opening like in the Ford. The Amaze's cabin feels airier too and the visibility both over the hood and through the sides is better than the on the Ford. Additionally, the Honda's seats are comfortable and soft, making it perfect for driving in town. But on longer drives, it's the EcoSport that comes out on top. The Honda doesn't amaze when it comes to dynamics. Like most of its siblings, the suspension in the Amaze is tuned more towards ride comfort and isn't perfectly tuned to offer a good balance between ride and handling like the Ford. Its steering is light but doesn't offer sufficient feedback. But a low kerb weight and a powerful motor ensures best in class performance. 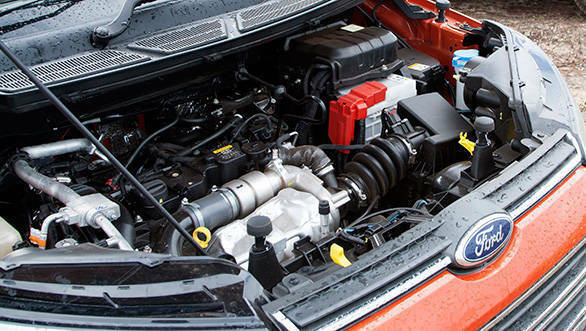 Both the EcoSport and Amaze feature 1.5-litre common-rail diesel motors, but the Honda i-DTEC engine produces more power and torque than the Ford (100PS and 200Nm of torque compared to 90PS and 181Nm of the EcoSport). On the road, better power delivery is evident in the Amaze, while turbo lag is minimal and there is enough power build-up from low down the rev range. 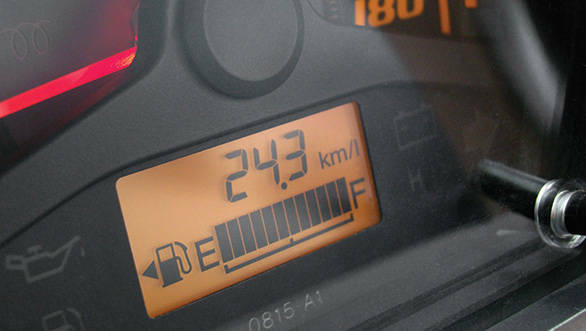 As a result, the car is quicker to 100kmph, manages quicker roll-on times, and amazingly, is more fuel-efficient too. 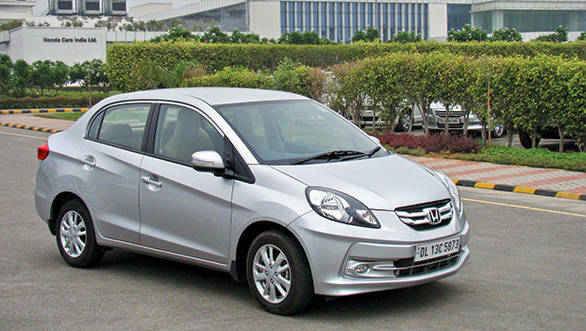 In fact, at 17.6kmpl, the Honda was the most fuel efficient car in the drive.